This Friday at 9pmET, FOX debuts its new legal drama series, “Proven Innocent”. It stars six-time Emmy winner Kelsey Grammer, who returns to FOX a little over a decade after his short-lived sitcom, “Back to You”. “Back to You” was a casualty of the 2007-2008 Writer’s Strike. Just 17 episodes were produced, and only 14 of them aired, before FOX decided to cancel the show due to (what they believed were) low ratings. Grammer then starred on the ABC comedy “Hank”, which performed even worse. 5 episodes aired on the network before the plug was pulled. Grammer chose Broadway as his next venture, with a Tony-nominated run in “La Cage Aux Folles”. He then headlined the Starz drama series “Boss”. 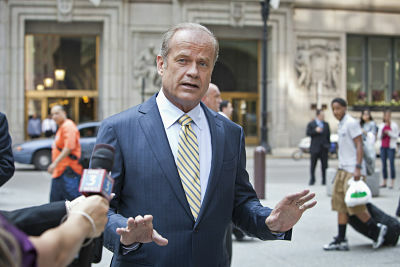 The role of Chicago mayor Tom Kane earned Grammer a Golden Globe Award. But many felt Starz cancelled “Boss” prematurely – after just 18 episodes over two seasons – once again due to weak ratings. That same theme ventured over into other series: the FX comedy “Partners” with Martin Lawrence and Amazon’s “The Last Tycoon” – both lasting a single season. So Grammer doesn’t exactly have luck on his side heading into “Proven Innocent”, a show that is also set in the Windy City of Chicago. A Friday night slot in midseason isn’t exactly the finest place to drum-up buzz or success in the TV landscape. But FOX certainly has faith in Grammer. He replaced actor Brian D’Arcy James (“Spotlight”, “Shrek the Musical”), who was in the role of prosecutor Gore Bellows in the Pilot episode. The network picked-up the series after viewing the Pilot – but they requested the high-profile casting change. 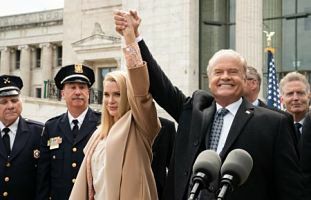 Will Kelsey Grammer, one of the biggest names in scripted television history, bring-in enough viewers to keep “Proven Innocent” around? He’s one of my favorite actors, so I’m going to give this a chance. We’ll see if millions of others do the same.